The environment around us informs our being, but equally the nature of our being can inform our environment. We can forget in among our insistence on individuality, of personal freedoms and beliefs, that we are profoundly psychologically affected by the environment around us. Just as our moods can rise and fall with the weather, we are effected by what is built around us. Variations in the physical characteristics of our surroundings influence our psychologies. In older cities, there is a confluence of designs and movements in their built spaces, these often inherently contradict each other – the sociological and aesthetic aims of architects vary from era to era and street to street, and therefore, there are wide variations in the physicalities and atmospheres induced by our urban environments. The streets dominated by close, tall buildings can inspire intimidation, the human being is rendered small and inadequate in their shadows. In heavily built inner-city spaces, where large populations work, overcrowding causes tension. Personal space is limited in the financial and commercial centres of cities. There is often little space for greenery, and therefore shelter and shade. Rain collects quickly in these tarmaced and paved spaces, and is splashed back at pedestrians by heavy traffic. Often the volume of people using these spaces means there is little room for seating, so it is a space for moving through. Stress and anxiety are indicative of such area, just as a dark open space can inspire fear. With the variation of some variables, the same open spaces can inspire relaxation, and populations gather towards them in their leisure time. Parks offer a holiday from the stress inducing spaces of the inner city; they offer places to go to at the weekend or somewhere to take a lunch break in. The light, colour, space, materials, geometry etc, of space influence us constantly, and transform our behaviours, moods and aspirations. However, sometimes our pre-existing anxieties make or transform a space beyond the typically natural evolution of the urban. The abstract nature of individual and collective fear can become solid, physical, realised in matter – a fear that builds walls, fences and forts. 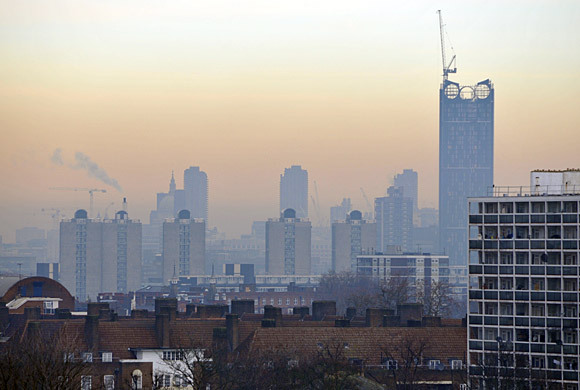 The built environment in late-capitalism comes to reflect the psychology of the population. Especially as the idea of living collectively and communally has diminished through the second half of the 20th Century and into the 21st Century. Post-war architecture had aimed at re-establishing communities; the philosophy of re-building after the war held at equality its centre, but it widely failed. Much postwar architecture attempted to invent utilitarian landscapes and communities, but found such buildings inept and people unwilling . Though the collapse of New Brutalist ideals is a complex issue, at an emotional level a prevalence of grey and brown can be debilitating, the heaviness and bluntness can cause unease, and the foreboding that results from visible decay can promptly destroy any community pride. The failings of the project reflects the wider issue of the increasingly economically disparate populations. With the late 20th Century emphasis on privatisiation and liberal markets the communal social housing project was undermined as dated and undesirable, consequently the desire to fund and sustain these projects waned. The idea of the democratic city fell apart with the increased emphasis on egoism. With the failings of the modernist project the singular community dwelling is a thing of the past. The form our private and public spaces take now revolves around the singular rather than the collective. This is where we witness the rise of gated communities and segregated urban spaces. Where in advanced capitalism the pressure for success is paramount, emphasis is on the individual. We want privacy over community, and build it that way. The public walkways of mass-estates and shared green space are deeply mistrusted now, and instead there is an emphasis on ‘defensible space’. Many have sought to escape the dangerous and spontaneous side of urban life by removing themselves from it. Gated communities are fear manifest, traditionally the domain of the retired, they are fast becoming the primary architectural model for masses of people. Many monitor everyone who goes in and out, wall themselves in, and camera the exteriors. They are conditioned and sterile, removed from the spontaneity and danger. Many attempt self-sufficiency, including their own private roads, shops, leisure amenities, and even energy supply and schools. The architecture here is built out of emotion rather than aiming to create it. The complexes popping up all over the world reflect the desire to escape the stress and uncertainly of a working urban life, but equally to provide an environment where one can pursue one’s desires without shame or guilt. A major feature of many gated communities is the emphasis on the leisure, from availability of green space, to golf complexes, tennis courts, running tracks and swimming pools. The architecture that follows fear lacks progressive design as it is not seeking to inspire beyond the nostalgic. Such architecture inspires simplicity and familiarity, whereas the modernist constructions of the past have left a legacy of unsurity. Fear stems the flow of creative design, so many of the newest gated communities offer nothing architecturally exceptional. Urban populations are more and more economically polarized – neo-liberal economies have moved affluence and poverty to extremes. The prevalence of cameras, wire, and walls in cities world-wide is not just symptomatic of a certain class to privatise their social life and leisure pursuits into a certain area, it is endemic of a profound disparity groups of people. The ever-increasing economic differences make the technicalities of living and existing together more and more difficult. Where economic difference extends beyond a traditional lower, middle and upper class mentality, to one of abject poverty and profound affluence, living side by side becomes incredibly difficult. It is unfair to assume that all gated communities are the result of unbridled golf egos, as crime in the most economically divided cities of the world is pandemic and violent. The social problems created by income cause robbery, muggings and assaults as the social contract collapses with the desire to recoup some of the difference. There is a fundamental desire to hide from the ever-more increasing differences in urban populations, especially where these differences can come back to haunt the more fortunate. 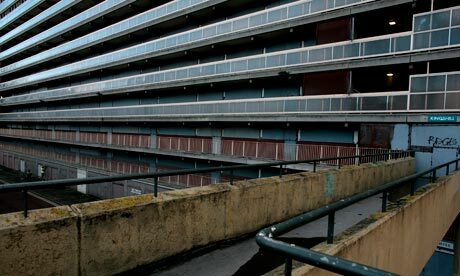 Everyday architecture is increasingly undemocratic, from large-scale measures of gated communities to the everyday anti-sitting devices on any flat services, and the innumerable CCTV cameras on every street. The ideals of urban community end when certain populations opt out of the city and others resort to crime to sustain themselves. The result is an architecture of division and fear, and these forms are certainly the shape of the future.